The loving couple is content doing regular activities like exercising or taking a stroll together. Dating for four years, the couple registered their marriage secretly in New Zealand in April last year, only announcing their marriage at the 2019 TVB Anniversary Awards. After their marriage, Priscilla and Edwin lead a low-key lifestyle and are content doing regular activities such as exercising or strolling together. In response, Edwin wrote that every breakfast Priscilla prepares is filled with the taste of happiness. He added that queuing up to buy bubble tea also allows him to take in the youthful aura of male students in the queue, while the fresh air at 5 a.m. is the best for driving around, adding “Even though it’s my birthday, you’re happy,” showing how much he appreciated Priscilla in his life. 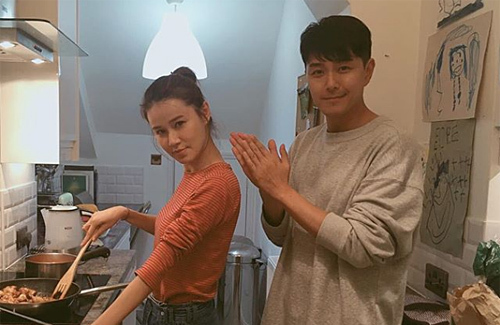 Their funny and sweet interactions have already gained 10,000 likes in half a day, with celebrity friends including Raymond Cho (曹永廉) and Natalie Tong (唐詩詠) playing along and sending their birthday wishes to Priscilla instead. That kitchen is tiny. And the artwork in the back makes them look like they have kids already. Edwin is so loud when he dresses for events that when he is at home or with Priscilla he seems much more calm and charming. Why would you wanted to register a marriage in a different country if you’re not even lived there? As you all know this couple are a money saver and she didn’t even washed her hair for a week because she wanted to saved money for the water isn’t it?